The global adhesives and sealants market is projected to expand in the next few years due to the rise in demand for adhesives and sealants from end-use industries and diverse applications. An adhesive is a compound blend that glues two surfaces to form a solitary unit. A sealant is a semisolid material used to prevent liquid spillage. The adhesives & sealants market has been segmented separately in the report. The adhesives market has been divided based on resin, technology, and application, while the sealants market is bifurcated into resin and application. Based on resin, the adhesives market has been segregated into acrylics, epoxy, poly vinyl acetate (PVA), polyurethane (PU), styrenic block, ethyl vinly acetate (EVA), and others such as silicone, polyester and fluoropolymer. In terms of resin, the sealants market has been categorized into acrylics, epoxy, poly vinyl acetate (PVA), polyurethane (PU), silicone, and others such as polyester and fluoropolymer. The acrylic resin segment dominates the adhesives market. These resins are extensively being used in the production of heat resistant, water-based, and UV curing adhesives. Moreover, resins have robust bonding characteristics, fast setting time, and good environmental resistance. The polyurethane adhesives segment accounted for significant share of the adhesives market in 2017. Use of PU resin to bond fiberglass, packaging laminations, footwear, and automotive windshield is rising due to its characteristics such as solidity, less curing time, and low viscosity. In terms of volume, silicone was a leading segment of the global sealants market in 2017. The segment is estimated to expand at a considerable pace owing to favorable properties such as high-temperature resistance, and implementation of various regulations supporting its application in a wide range of sectors such as building & construction. Based on technology, the adhesives market has been classified into water-based, solvent-based, hot melt, and reactive and others, which include powder-based and oil-based. The water-based segment of the adhesives market is estimated to expand rapidly during the forecast period due to its eco-friendly nature. Water-borne adhesives meet the standards imposed by the U.S. and European Union on VOC emissions. In addition to low toxicity, their high water content makes water-based adhesives less flammable and reduces hazardous waste disposal. In terms of application, the adhesives market has been divided into paper & packaging, building & construction, woodworking, automotive & transportation, consumer/DYI, leather & footwear, others such as electronics and marine. The sealants market has been categorized into building & construction, automotive & transportation, consumer, others, which includes industrial, woodworking, packaging, and electronics. The automotive segment of the adhesives market is projected to expand at a significant pace during the forecast period. Advancements in technology have reduced the application of spot welding by nearly 50%, which has helped reduce the overall weight of automobiles. Furthermore, implementation of stringent regulations in the U.S. to increase fuel efficiency has prompted major manufacturers to reduce the weight of automobiles. This, in turn, is driving the demand for adhesives in automotive and transportation application. Innovation in packaging due to introduction of flexible packaging is expected to drive the demand for adhesives in the paper & packaging segment. Adhesives & sealants are used in the packaging industry to ensure that the package stays sealed during warehousing, distribution, and display. Surge in the packaging industry in Asia Pacific is estimated to fuel the utilization of adhesives & sealants. Sealants are also extensively utilized in building & construction and industrial applications as they provide flexibility in processing and improve longevity the materials. Based on region, the global adhesives & sealants market has been split into North America, Europe, Asia Pacific, Latin America, and Middle East & Africa. In terms of consumption, Asia Pacific is expected to create lucrative opportunities for the adhesives & sealants market during the forecast period. The market in China and India is expanding at a significant pace. This, in turn, is boosting the demand for building and construction materials, including adhesives & sealants. Growth in the manufacturing sector in countries such as China, India, and Japan is anticipated to drive the demand for adhesives & sealants in industrial, automotive, and electrical & electronics industries in the region. Surge in automotive production in China and India is propelling the demand for adhesives & sealants in these countries. In terms of consumption, Germany, the U.K., and France, account for large share of the adhesives market in Europe. Adhesives are extensively used in a wide range of applications. The market in Europe is driven by increasing demand from industries such as automobile and electronics. Adhesives and sealants market has been segmented separately in the report. The adhesives market has been segmented based on resin, technology, and application. However, the sealants market is bifurcated in terms of resin and application. Based on resin, the adhesives market has been segmented into acrylics, epoxy, poly vinyl acetate (PVA), polyurethane (PU), styrenic block, ethyl vinly acetate (EVA), and others, which include resins such as silicone, polyester, and Fluoropolymer. In terms of resin, the sealants market has been segregated into acrylics, epoxy, poly vinyl acetate (PVA), polyurethane (PU), silicone, and other resins such as polyester and Fluoropolymer. The acrylic resin segment dominated the global adhesives market. Acrylic resins are significantly being used in the production of heat resistant, water-based, and UV curing adhesives. Moreover, resins have robust bonding characteristics, fast setting time, and good environmental resistance. In terms of volume, silicone is a leading resin segment of the global sealants market in 2017. The segment is projected to expand at a considerable pace during the forecast period owing to its favorable properties such as high-temperature resistance and implementation of various regulations supporting their use in a wide range of sectors such as building & construction. Based on technology, the adhesives market has been classified into water-based, solvent-based, hot melt, and reactive & other technologies, which includes powder-based and oil-based. The water-based segment of the adhesives market is estimated to expand rapid pace during the forecast period due to their eco-friendly nature. Water-based adhesives meet the standards set by the U.S. and European Union on VOC emissions. In addition to low toxicity, their high water content makes water-based adhesives less flammable and reduces hazardous waste disposal. In terms of application, the adhesives market has been segregated into paper & packaging, building & construction, woodworking, automotive & transportation, consumer/DYI, leather & footwear, others, which include electronics and marine. The sealants market has been divided into building & construction, automotive & transportation, consumer, and others, which includes industrial, woodworking, packaging, and electronics. The automotive & transportation segment is projected to expand at a significant pace during the forecast period. Recent advancements in technology have reduce the application of spot welding by almost 50%. This has helped reduce the overall weight of automobiles. Additionally, implementations of stringent regulations in the U.S. to increase fuel efficiency has prompted major manufacturers to reduce weight of automobiles. This, in turn, is driving the demand for adhesives in automotive and transportation applications. Innovation in packaging due to the introduction of flexible packaging is expected to drive the demand for adhesives in the paper & packaging application. Adhesives & sealants are used in the packaging sector to ensure that the package stays sealed during warehousing, distribution, and display. Rapid expansion of the packaging industry in Asia Pacific is estimated to boost the utilization of adhesives & sealants. Sealants are extensively employed in building & construction and industrial industries, as they offer flexibility in processing and improves longevity of materials used. Based on region, the adhesives & sealants market has been categorized into North America, Europe, Asia Pacific, Latin America, and Middle East & Africa. 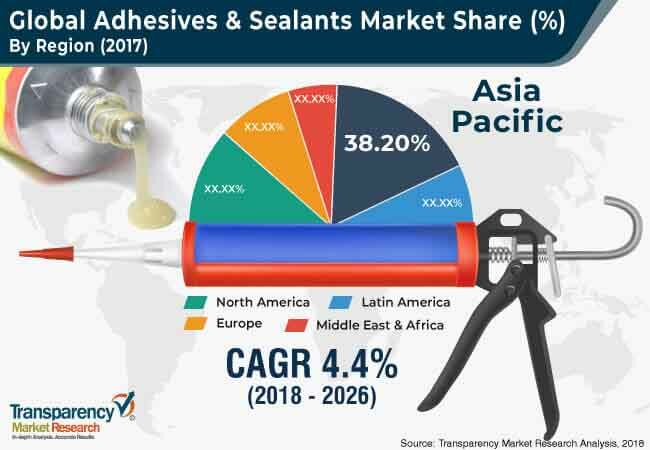 In terms of consumption, Asia Pacific is expected to create lucrative opportunities for the adhesives & sealants market during the forecast period. The market in countries in Asia Pacific, especially China and India, is expanding at a significant pace. This, in turn, is boosting the demand for building and construction materials such as adhesives & sealants. Growth in the manufacturing sector in countries such as China, India, and Japan is anticipated to drive the demand for adhesives & sealants in industrial, automotive, and electrical and electronics sectors in the region. Surge in automotive production in China and India has increased the demand for adhesives & sealants in these countries. The report analyzes and forecasts the adhesives & sealants market at global and regional levels. The market has been forecast in terms of volume (Kilo Tons) and revenue (US$ Mn) from 2018 to 2026. The study includes drivers and restraints of the global adhesives & sealants market. It also includes the expected impact of these drivers and restraints on the demand for adhesives & sealants during the forecast period. The report also highlights opportunities for the adhesives & sealants market at global and regional levels. The report comprises a detailed value chain analysis, which provides a comprehensive view of the global adhesives & sealants market. The Porter’s Five Forces model for the adhesives & sealants market has been included to help understand the competition landscape. The study encompasses market attractiveness analysis, wherein segments have been benchmarked by resin, technology, and application based on their market size, growth rate, and general attractiveness. The study provides a decisive view of the global adhesives & sealants market by segmenting it in terms of by base resin, technology, application, and region. These segments have been analyzed based on present and future trends. Regional segmentation includes current and future demand for adhesives & sealants in North America, Europe, Asia Pacific, Latin America, and Middle East & Africa. The report also covers segmentation based on individual by resin, technology, and application all regions. The study includes profiles of major companies operating in the global adhesives & sealants market. Major companies operating in the adhesives & sealants market include Henkel AG and Co. KGaA, Sika AG., Bostik SA, RPM International Inc., KCC Corporation, H.B. Fuller Company, The 3M Company, Illinois Tool Works Inc., Avery Dennison Corporation, Huntsman International LLC., DowDuPont Inc., Ashland, and Akzo Nobel N.V. The report provides an estimated market size of the global adhesives & sealants market for 2017 and forecast for the next nine years. The size of the global adhesives & sealants market has been provided in terms of volume and value. Market numbers have been estimated based on resin, technology, application, and region. The market size and forecast for each resin, technology, and application segments have been provided for global and regional markets.